Review # 26 for RedMaverickZero ARROWED!!! Do you remember your favorite food? Of course you do it's your favorite. Well, you can eat it over and over and still like it right? That's half true. For instance, with me and the ole mac and cheese. I can eat it on one day, the next, but on the third day, it's just not good. With that same concept, the ole 1, 2, 3 Shadowiii has brought that to the OHR. 1,2,3. These are the order of which I have played these games coincidentally. Pitchblack, OHR-Date, Crystal Globe. In this case, Shadowiii's games are the mac and cheese. Anyways, on with the review. When I first played Pitch Black I thought the graphics were great. Especially the thing where you moved the hand. The backgrounds for that were simply great. Then I read somewhere that Shadowiii was saying his pictures were random Google searchs. I realize on one's own those pictures would be an incredible feat to muster, but still I lost a lil respect for the graphics of the game, not the game itself. (still good). 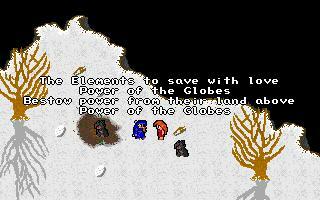 Anyways, from what I can gather, Shadowiii used that same trick here in Crystal Globe. For the whopping one backdrop for fights. And ironically the only fight. But battles are later. The backdrop is ver nice, obviouslly snow. Which is "cool" (hehe, bad pun) and is easy to show shading on. And the overall detail is nice. But the color rendition from whatever it looked like before to now really messed it up. The walkabouts are fine. They're probally the best part of the game. But as we all know, graphics don't make the game. But they help. And if this game was ever to be finished it would not only look good, but most likely have a good story to support it. But with two text boxes, it's real hard to tell where it would go. But the color preportioning in the game is real nice. The maptiles are also astounding to look at. The NPCs and walkabouts are detailed. But the real complaint lies in the hero sprites. Okay there really only is one bad thing. And it occurs in one frame that I happened to see. The character Ferina's walk to step graphics change. And not because she's moving. Because out of nowhere, like magic she gains a black outline. Weird. This game really could have used one. And it's a shame it didn't. The graphics would have supported it I am sure. But with two text boxes what can you do? I really can't talk about anything that isn't there. The only real gameplay is the random battles. Which features one enemy on one battle. It would be creepy if I got in just one fight. Damn, all these ones are starting to freak me out now that I think about it. One hero, one enemy, one battle. ONE MINUTE OF GAMEPLAY! ARGH! Okay, too many ones. The gameplay lacked in every area. From story, to everything again. Nothing was supported at all here by anything other than graphics. No scripting. Nothing. Nadda, zip. Drats, I almost got to skip this section too. If not for the one battle I got in. Anyways, the one battle was pretty lame. 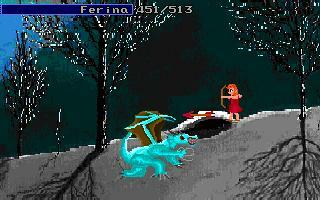 It was basically like this: ME=FIRE ARROWS ENEMY=ICE DRAGON. Fire beat ice. Har har. And that was the fight. The enemy did 30-40 damage, I did 100+. You get the picture. Unfortunately without any items or healing spells really, after two fights you knew you wouldn't make it past the third. It was a given. Anyways, if healing items were added and level ups were added more generouslly then it wouldn't be so bad. And the one thing I hate that people do. Is make the battles too hard for the beginning of the game. Maps had a solid structure. Since snow is pretty vague as to the things other than rocks or trees. Yet the size of the maps wasn't bad. Even if it did start out a tad like Aquarius. Where it's a long straight walk. The graphics really had little variety in this area but they really did support this area. My only complaint which goes for story, battle, gameplay, and everything is... ADD MORE STUFF! Ugh, I hate wasted potential. The game had no healing items, no real true gameplay. And above all... It just doesn't have much. Yet for what there is, aside from the 3 battles you die method, it was balanced. If the main character had at least a poor excuse for a healing spell it would have been a very short very wasted balanced game. But, it's more balanced than some games I've played. I give ya that Shadowiii. Finish this game dude. This seems to be the second game I have reviewed that I went into reviewing knowing the creator wouldn't finish the game. FFH-2 (FINISH IT FEN!) and now this. The main difference between this and FFH-2 was errr EVERYTHING. Except the fact that they both won't be finished. Anyways, good graphics. I can tell it was your stuff early on, but it's still good dude. Keep it all up, and later on we will see more of your hard work paid off in Stop. He's trying to speak to me! I know it! The highpoint of the game. Yet graphics don't make the game. You should know that by now! Shadowiii, if I could see the look on your face when you see this game on the review list, I would make the enjoyment score go up. Haha. A game that shows potential. Unfortunately it is potential Shadowiii claims he will never use on this game.